We offer laser vision correction for those who are nearsighted, farsighted, or have astigmatism. When explaining the procedure, we make sure that every question is answered clearly and without the hype. Our eye care specialists in Bethesda, MD recognize that this is a serious procedure not to be taken lightly. The procedure is excellent but not for everyone. Most problems occur when the wrong patients undergo the procedure. Some examples that preclude one from being a candidate are: large pupils, unstabile prescriptions, and expectations beyond what the procedure is capable of doing. 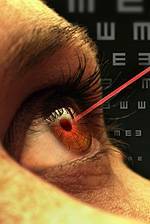 Potential candidates need to be made aware of what laser vision correction can and cannot do. We go through that aspect completely along with all potential risks. In addition, our office uses state of the art computerized eye examinations to aid in the determination of the proper measurements for the procedure. We are affiliated with most local laser centers but use mainly The Laser Eye Center (TLC) in Rockville where professional golfer, Tiger Woods, had his procedure performed. Call today for a free in-office consult. See if you’re a candidate. Drs. Berenhaus and Katchuk have had numerous patients undergo the lasik procedure successfully. Dr. Berenhaus has been published in the health section of The Washington Post discussing lasik.